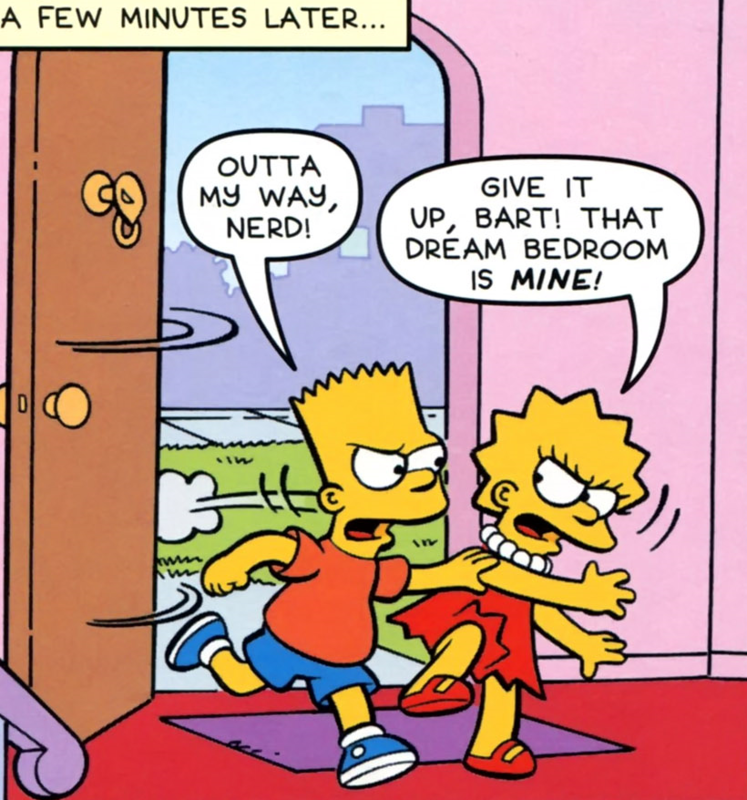 Bedroom Battle is a Bart Simpson Comics story that appears in Bart Simpson #96. "Bart and Lisa find themselves embattled over just who won a "dream" bedroom contest." Bart and Lisa are listening on Bill and Marty one KBBL, which have a competition. The 157th caller will win, literally their dream bedroom. Bart and Lisa are calling at the sametime as number 157 and the both are the winners. They begin arguing about who should have the price. The next day at the school came Milhouse with the idea that the students should to vote on which bedroom they should build. Bart telling his dream bedroom, it would have a shark tank with water slide, a skate ramp park, a gaming lounge, a Squishee bar, a comic book valut, fireworks armory, a secured door, and a slingshot range. Lisa tell her dream bedroom. It will have a libary, a stable, a lush meadow, a petting zoo, a recording stereo, a wall of great women, a telescope and a science lab. The voting ending tie so it didn't help them. It's time to build the bedroom but it turns out that the carpenters who are going to do the bedrom driving to the Flanders family and it turns out that the next call which was Rod & Todd won instead beacuse they started arguing and not left any more information to Bill and Marty. Rod and Tood's new bedroom is Noah's ark and they invites Bart and Lisa to a tea party and they realize that it was stupid to argument over the bedroom and it has getting them closer as siblings. Wikisimpsons has a collection of images related to Bedroom Battle. Modified on September 14, 2016, at 17:09.